Hydrogen peroxide is broken down in our bodies, in the bombardier beetle and in order to clean contact lenses. Contact lenses have to be cleaned regularly because a film of fat or protein tends to be deposited on them as they are used. Such deposits can act as substrates for mico-organisms which may damage the lens or the eye. 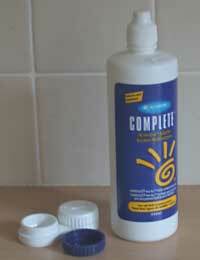 Picture 8.9 It's important to keep contact lenses clean to avoid damaging your eys. The most often used procedure for disinfecting the lens is based on the oxidising effect of oxygen atoms released during the decomposition of hydrogen peroxide. The hydrogen peroxide used for this purpose has a concentration between 1 and 5% and is stabilised with 0.1% disodium EDTA so that it does not break down before it is needed. After the contact lens has been rubbed with or immersed in the hydrogen peroxide solution, any remaining peroxide must be destroyed because it could damage the eye. This is achieved by adding a solution of catalase to catalyse the decomposition. In older cleaning procedures, the decomposition was achieved with the help of a metal catalyst coated in platinum. A one-stage process has now been developed in which the contact lens is placed in hydrogen peroxide solution together with a tablet that swells up and releases catalase when it becomes wet. The amount of catalase and the rate at which it is released are carefully controlled so that the hydrogen peroxide has time to clean the lens and there is sufficient catalyst to decompose all of the peroxide. The lens can be worn without any further treatment.